From political cartoonist Walt Handelsman.. Regular gasoline is going for $3.65/gallon at the discount places near my home this weekend, and diesel has been over $4/gallon for a couple of weeks now. How much is it where you live? Gas was $3.12 at costco this morning. It’s a great day becuase I was on my bike as I rode by from work. I don’t think this situation is getting any better soon! I think the 89 Octane/10% Ethanol stuff is about $3.15 per gallon here in Lincoln. Premium is around 3.50. I rode to work today as well. But it turns out that we just pay a boat load of tax! I see $3.67 regular unleaded in Chicago. $3.269 for 87 octane regular in suburban MD this morning. We drove just across the PA border for our last day of mid-Atlantic skiing for the season and I was surpirised by the number of cars that were keeping it to 65 mph. Of course, this appeared to annoy drivers of H2s and Escalades trying to maintain 80mph. What I find interesting is that it costs much less to refine diesel fuel yet it sells for more, the reverse of what it was years ago. The oil industry is a huge screw job. $3.09 in Minneapolis. Many of us ride year around here, warm clothes and studded tires. That said, we are finally getting to warmer weather and I’ll not drive a car for many months to come. The dollar is worth much less than it once was. Therefore it takes more dollars to buy the same amount of goods. Yes, the laws of supply and demand are affecting the price of gas, and the oil companies are screwing us, but the value of the dollar is ultimately responsible. Gas is $3.35/gallon here, but my county has 6 cents more tax per gallon than our neighboring counties. That 6 cents was passed to pay for future road improvements the county commissioners(who are all in the pockets of the builders) said we would need due to the housing boom. Well, guess what? The housing market has died here. Hundreds of construction workers are out of jobs. Very few houses are being started. BUT I don’t see the taxes coming down. The only good news is the proposed road improvements include 10 miles of multi-use trail to connect to the Withlacoochee Trail. As it stands now, I can get on the Suncoast Trail and ride down to Tampa—-but I don’t know how to get to Seminole Heights, Jack! In Austin, TX gas is going for $3.15 a gallon. $3.19 for the 89 octane with 10% Ethanol here in Sioux Falls, SD. Went to my LBS looking for a commuter today (Bianchi San Jose), not just because of the price of gas, but health and other things too, like most others here…but yeah, the price of gas is definately helping with the push to get started. No San Jose’s in stock, sold the last yesterday, so they will be checking Monday if they can get one….if not, I will be seeing what it will cost to build up a Surly Cross Check. Sorry to steal the thread….. I calculated my mileage for a while but found it hard to remember to check the car odometer when I didn’t get into the car until the middle of the month. Saw signs for $3.29/gallon for 87 here in Asheville, and am hearing more moaning from friends and coworkers about the cost of gas, and the overall lack of buying power of the dollar. Groceries are killing me these days, no doubt a result of sustained higher fuel costs. I don’t own a car, but I think here in Norway it’s close to $9 a gallon. Depending on where you look, it runs from $2.98 to $3.05 in my part of NJ. From what I hear so far NJ has the lowest gas prices in the US. I’m glad the bike is entering the consciousness of motorists in one form or the other. I’ll have to remember to look at the prices at the gas station the next time I’m near one. I’m usually looking for something to put in my water bottles when I’m at an establishment that sells gas ;-). BTW, I saw on CBS a story about this gas station in Gordon CA. When they started filming in the morning, the posted price was $5.19, when they were wrapping it up, the price was $5.39! Thanks for the comments, all. It’s interesting to see the variations around the USA and the world. Gordon is a suburb of Fresno, where the most expensive premium is selling for $3.97 right now. $5+ would be for 100 octane fuel for high performance sports cars like Ferrari’s and such. California is sports car central. I regularly see a yellow Lotus Elise and a red Lambourghini Diablo on my commute in Silicon Valley — it’s kind of fun to pass them in congested traffic. I occasionally run into an older Delorean near my home. I also saw a late model Maserati last week — wow, that’s an amazing automobile. It’s $3.17 this morning in Boise. I’m not sure what the price generally is. The media says that the price of gas in a prime concern of all Americans. Yet, living in a 1 car family that my SO primarily drives on her 5 mile roundtrip commute, by the time we wind up filing the car, the price has changed dramatically up or down, fill-up to fill-up. 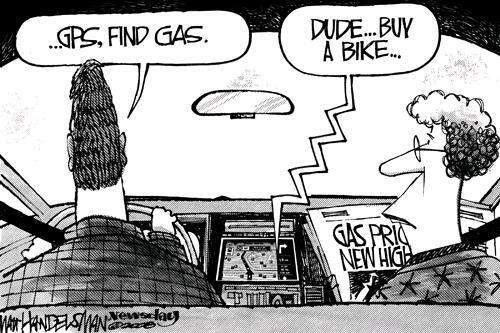 Doing most of my traveling by bicycle, the price of gas here in eastern Virginia is mostly unknown to me. Regardless of the exact number, people have nothing to complain about in the current price of gas, because it’s definitely heavily subsidized (if to an unknown degree), so they’re already getting a big break. Hey there, consider yourselves lucky. We are being gouged to the tune of $5.75 per gallon,CDN. It is nothing more than greed, gouging, and imaginary “fears” by “speculators”. They are screwing us bigtime. You’ll see the price of gas fall dramatically because of their fear of lost sales and the fact that they realize that we can affect their bottom line. How about this one then, in the UK regular unleaded is.Â£1.11 per litre or.Â£5.04 per UK Gallon or $9.42 at todays (22nd Aug) exchange rate! $4.06 here in Bangalore, India.